2016 Halloween is around the cornner. Are you ready for Trick or Treat? EaseUS here is offering you, of course, a big treat. From Oct.20, 2016 to Oct.31, 2016, you can take part in the following two campagins in which you might be able to win $40 PayPal gift card, plus EaseUS software. 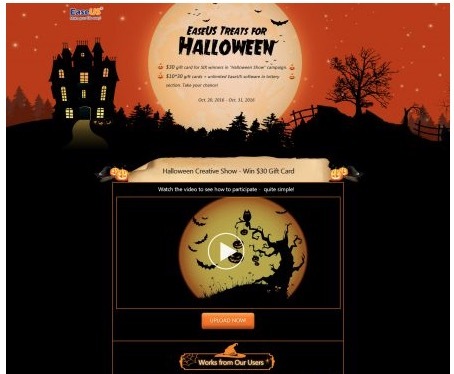 Campaign 1 Create interesting pictures related to Halloween to win $30 gift card sent via PayPal. Campaign 2 EaseUS Lottery for you to win $10 gift card, EaseUS Data Recovery Wizard Pro, EaseUS Partition Master Pro, EaseUS Todo Backup Home, EaseUS Todo PCTrans Pro, etc.